We find that the competitor mapping stage is vital for helping a client realise just how high the standard of competition can be. We use competitor mapping partially as a diagnostic tool and partially as a creative thinking tool. We use competitor maps to help tease out the brand attributes that can be used to differentiate a client’s brand. I learned this unusual technique from Brian Richards who used it successfully with Icebreaker (and other clients) to help find their most important points of difference. Mapping out the competitor positioning is best done in collaboration as a team. The trick is to keep remixing the axes of the graph until you find some competitive breathing room. The goal isn’t “up and to the right”, it’s “blue ocean”. The diagrams look like Gartner Quadrants or BCG Matrixes but they’re slightly different because they are about contrasting emotional attributes (from the perspective of your audience). There is no inherently good “up and to the right” on these maps; the key is to look for gaps in the mind-space of your audience. 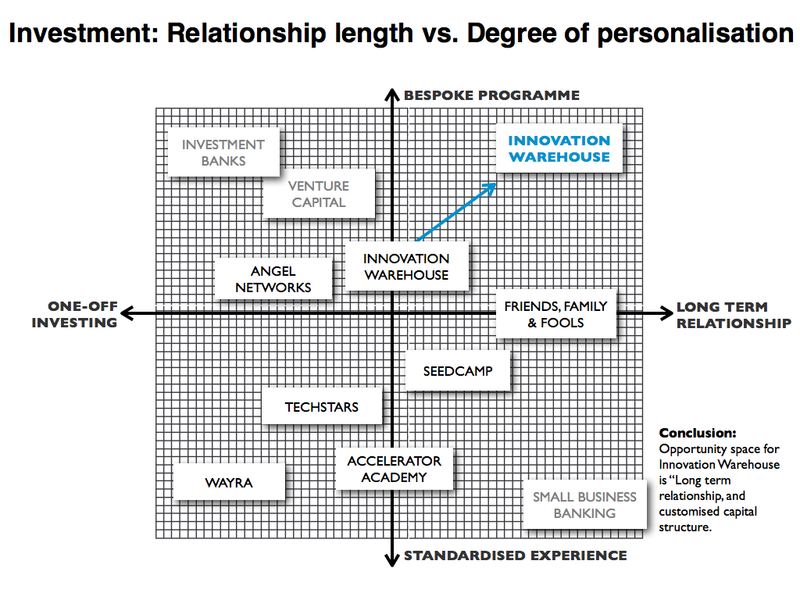 Here’s how we presented to the competitive positioning process to the Innovation Warehouse management team…. We think the key to positioning the Innovation Warehouse is to separate out the investment programmes from the co-working space and position them honestly in their respective markets. You may not think of some of these players as “competitors” but they are substitute behaviours that an entrepreneur could take instead of engaging with the Innovation Warehouse. Sometimes, your fiercest competitor is having your audience choose to “do nothing”. Innovation Warehouse can differentiate with a focus on hard-working and intelligent entrepreneurs. 1. What motivates the RESIDENT entrepreneurs? We think there are some really interesting cultural tensions in the entrepreneurship support marketplace in London. The first is the tension between the perceived glamour of entrepreneurial success and the seriously hard work required in real life to succeed in building a technology business. I didn’t get the banking job I wanted, but I’ve seen the movie The Social Network. So, I’m going to sit in a cafe with my latte and laptop. I can tell my friends that I have a startup. I’ll play foosball, sit on a beanbag, listen to music and have fun. Startups have become the new rock and roll. On the one hand, we think that is great for society, but the risk is that it’s selling a dream that isn’t real. Personally, we think that it’s great to encourage entrepreneurship and that it can be fun. 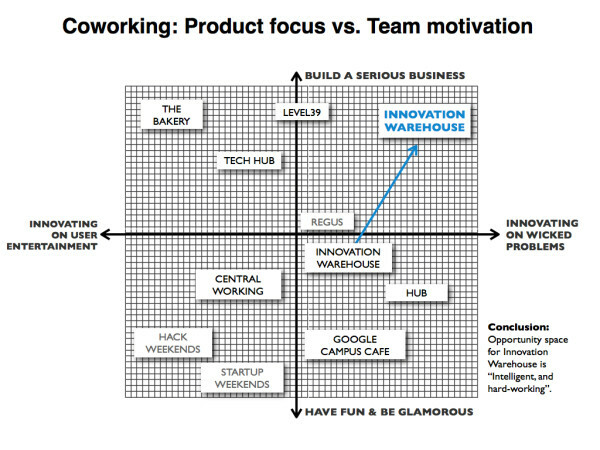 But the tone of the Innovation Warehouse is more focused on the hard work required to succeed in real life. Up close, running a business is hard work. There is an opportunity for the Innovation Warehouse to move from promising on its website to be a “Fun, dynamic, creative space” (and then not delivering on that promise). The brand would have more integrity if it promised explicitly what it actually delivers, which is a “productive environment”. The shared office space is perfect for teams of 3-5 people. The Innovation Warehouse breeds pragmatism. There are no business owners here with rose-tinted glasses; they know that there is work to be done in order to build a high-growth business. 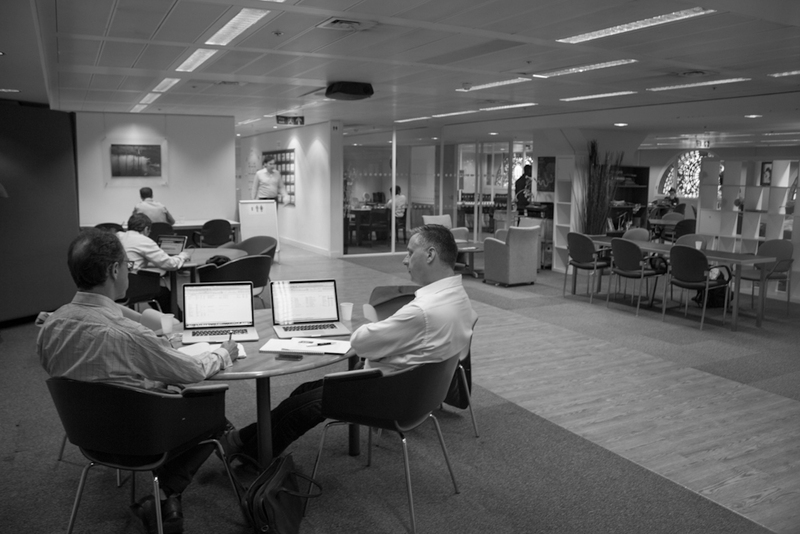 Everything from your opening hours and quiet spaces; to meeting rooms and flexible membership terms is geared towards a demographic of hard-working entrepreneurs. 2. 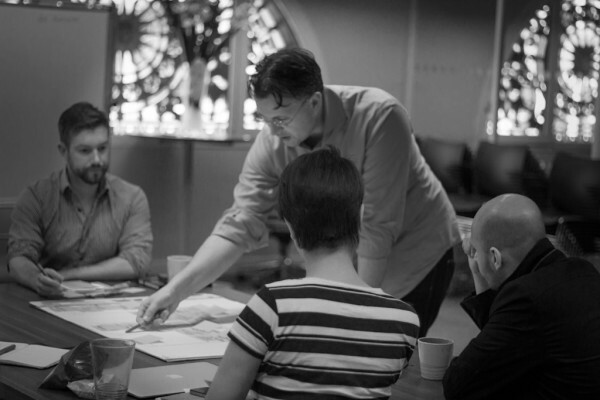 What are the resident entrepreneurs working on? There is another point of difference for the Innovation Warehouse: the tension between solving wicked problems and solving simple problems. Wicked problems include: big data, analytics, commercialising military research, societal problems, deep mathematics or creative use of science and technology. Startups working on these types of wicked problems are valued by their intellectual property. Simple problems can be just as big (often bigger) businesses but they have a different tone. They salve simple customer pains in simple ways such as games, entertainment, social networking and simple mobile applications. 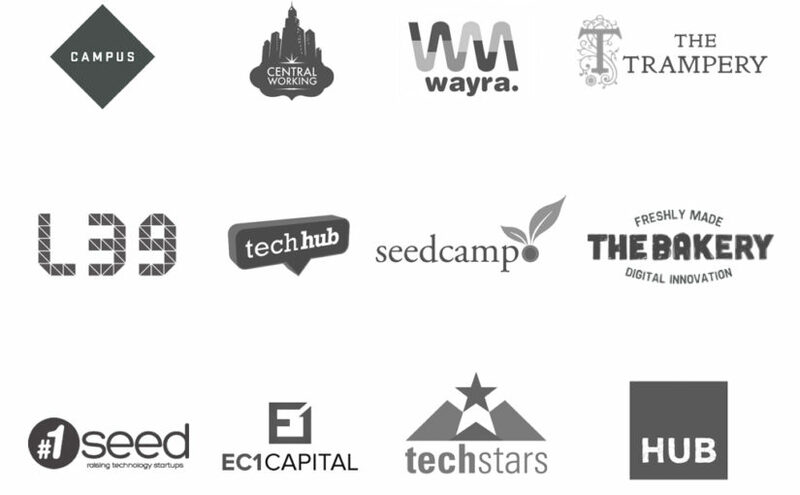 Such startups are often valued by their ability to cause rapid expansion in user numbers. We see a lot more companies at the Innovation Warehouse working on wicked problems. Your members are going after those big, tough societal problems. This means that they are often very intelligent and thoughtful people. The mix of investment activities of the Innovation Warehouse are unique and don’t have any direct competitors. But, from the customer’s perspective, there are lots of substitute behaviours. On the one hand, handing out money should be the easiest thing in the world to promote. But investing in high-growth entrepreneurs (on mutually attractive commercial terms) is a very competitive space. Innovation Warehouse can differentiate by combining unique capital structures with long-term relationships. 1. How long is the relationship? The Innovation Warehouse has access to a range of intelligent angels who pride themselves on taking the time to evaluate business propositions that might confuse other investors (either because of the underlying science or because of the capital structure required). 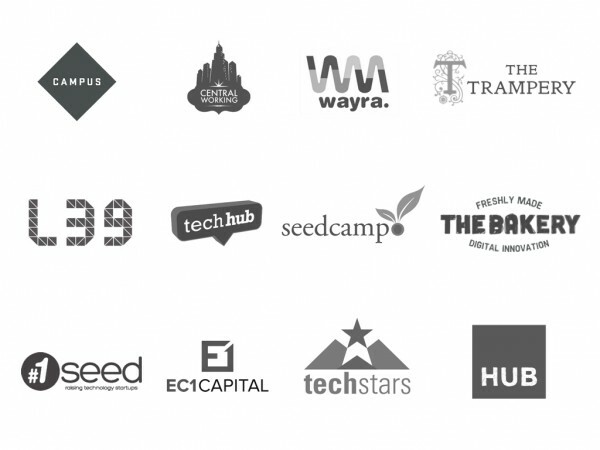 To make these types of investment, the Innovation Warehouse has a whole range of incubator, accelerator and seed-investing activities (that gradually build a relationship over time). The entrepreneur feels that they are being invested in by someone who really knows them. 2. How unique is the capital structure? 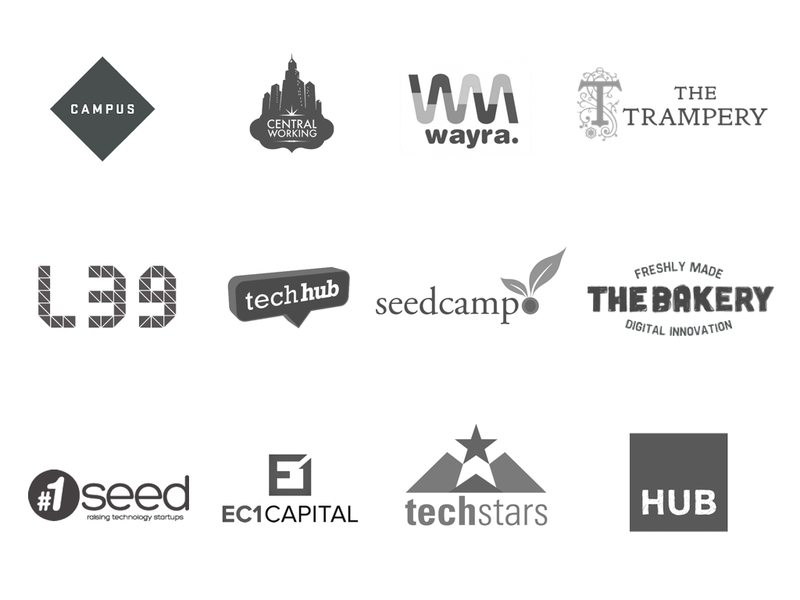 Most startup accelerators only offer standard equity investment with standard terms. The range of valuations and percentages may be negotiable, but the fundamental investment relationship is standardised. This is fine for most general cases. But any startup with more specific growth needs might require a unique capital structure. Taking a lean (in the sense of lean manufacturing and lean startup) approach to investing means making smaller investments on a more regular basis. The current norm is that it takes an entrepreneur six months to raise capital. This means they have to ask for long runways (cash to burn) and high valuations. But if the investor and startup had a more trusting and more long-term relationship then the individual rounds could be smaller and the valuations could increase gradually over time. Lean investing would look more like a revolving line of credit than a one-off house mortgage. 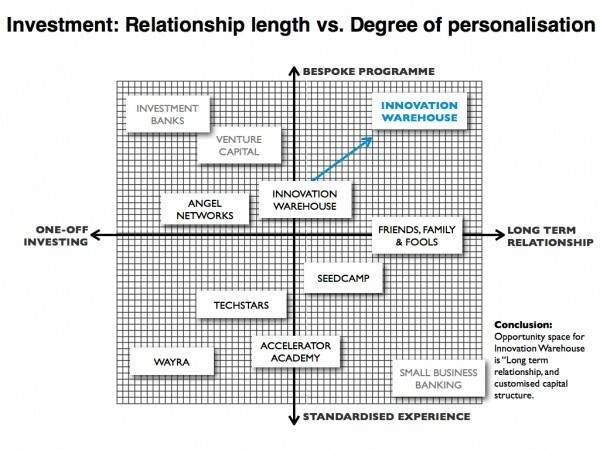 Innovation Warehouse provides an entirely bespoke acceleration process. Entrepreneurs can start at any time and the capital structure can change over the course of the relationship. 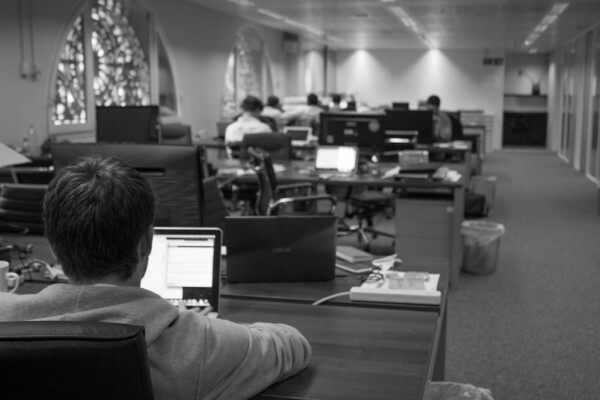 The Innovation Warehouse angel investing activities are more long-term focused. There are nuances in a long-term investment relationship such as dilutable vs. non-dilutable stock, preferred or common stock, voting rights, stock options, convertible notes and mezzanine debt structures that a normal startup accelerator can’t account for. The competitor maps build on the early brand audit and brand strategy stages. They are some of the most important inputs for the next strategy, messaging and design phases. You can follow the journey on the Innovation Warehouse blog, Klaus Bravenboer‘s blog and on Twitter at @IWLondon.